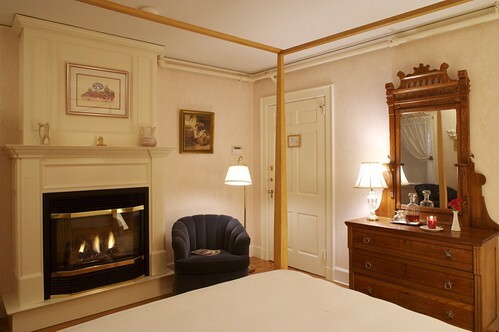 Valentine’s Day is just around the corner, and now is the time to plan to sweep your sweetie off his or her feet with a stay in a romantic bed and breakfast Berkshires. Under normal circumstances, a little getaway to our Lee MA b&b can be pretty darn romantic. A beautiful setting, lazy mornings and delicious breakfasts help set a certain tone. Roaring fires in the winter add a nice touch, as does the brandy you’ll find in your room at bedtime. If you are looking to create an ultra-romantic mood for Valentine’s Day, we offer two Romance Packages at our inn. You’re room will have its own fireplace, ready to be lit. We’ll feed you a three-course dinner for two, by candlelight. Your room will have a soaking tub and steam shower or a whirlpool large enough for two. We’ll bring a split of champagne and chocolate to your room, and we’ll leave you alone. It is possible to add to this with our Ultimate Romance Package, which includes fresh flowers and a framed 8×10 photo of your time together here. Of course, there is plenty to do in and around Lee MA should you decide to leave your room. Excellent restaurants, art galleries and shops await, as do miles of cross-country and downhill ski trails. Sometimes it’s just nice to do something extra special for the person you love.